Thanks Skirted Brit. I've found a source of waistcoats which come in a multitude of plain colours, at not excessive prices, and have ordered one - should be with me later today or tomorrow. Basically to see first if it fits. It's a maroon one which might go with my maroon flash pleated Team Kilt from Sportkilt. Hi Pete, I think the leather kilt looks just fine on you – the whole outfit works well. I have a cheap leather kilt (step-in style, so really more of a skirt) which I am happy to wear anywhere – hiking, shopping, meal out etc. partlyscot, apart from the kilt, I also have a midi-length http://www.skirtcafe.org/forums/download/file.php?id=4879 and an ankle-length black http://www.skirtcafe.org/forums/download/file.php?id=4854 leather skirt, and wear both quite often, particularly in the winter. Thanks for those pics DonaldG. Where did you get that first one? I got the kilt in the above photo from a company called Off-Pat . I think the one in this link is similar: http://www.off-pat.com/index.php/fancy-dress-period-costume/mens-brown-real-leather-matrix-steampunk-van-helsing-trench-coat-most-sizes-4.html. Mine is the 20 inch option, but it's a bit short when sitting, so the 24 inch length might have been better. Very smart. Not so sure about the red shirt, but the kilt and socks are brilliant. DonaldG wrote: I got the kilt in the above photo from a company called Off-Pat . I think the one in this link is similar: http://www.off-pat.com/index.php/fancy-dress-period-costume/mens-brown-real-leather-matrix-steampunk-van-helsing-trench-coat-most-sizes-4.html. I found this page rather disturbing. Imagine Tom (Kirbstone) trying to get Benjy to wear one of the first three items on the page. DonaldG wrote: Mine is the 20 inch option, but it's a bit short when sitting, so the 24 inch length might have been better. Leather might not drape when sitting so you could try pressing the skirt (Ahem, kilt) down between your knees when sitting. 20" looks good on you. Milfmog wrote: I found this page rather disturbing. Imagine Tom (Kirbstone) trying to get Benjy to wear one of the first three items on the page. No dog would like those. Here in Ireland it is the Law to muzzle certain breeds when in public places. German Shepherds belong there. Round here & on the local bog I just walk him with a haltie (that steers his nose) which he finds OK. Down in Kerry in the high season I do muzzle him when the beach & harbour areas will be visited. Off season it's the haltie down there, too. I can't imagine what sort of a pervert would put a dog into those masks illustrated. Kirbstone wrote: I can't imagine what sort of a pervert would put a dog into those masks illustrated. They are meant for people not dogs. Quireboy...the red shirt is admittedly not something I'd walk around town in. It's purely theatrical for glitzy stage use. Whether I'll use it or not I'm still not certain. This last couple of days I've given the leather kilt (this topic started off with) three outings, and enjoyed every minute of them. Sitting is easy as it sinks between the legs like any other kilt. The only regret is that being of heavyweight leather there is no swish to the pleats, which I particularly like with kilts when striding along. But apart from that it feels like I shall see many years of use from it, it being pretty much indestructible. It can't easily rip or snag or fray. On my last outing in it I bumped into a woman shopping who I know from the music club I belong to. She made no comment on it and we discussed an upcoming visiting musician we're looking forward to listening to at the next meet. 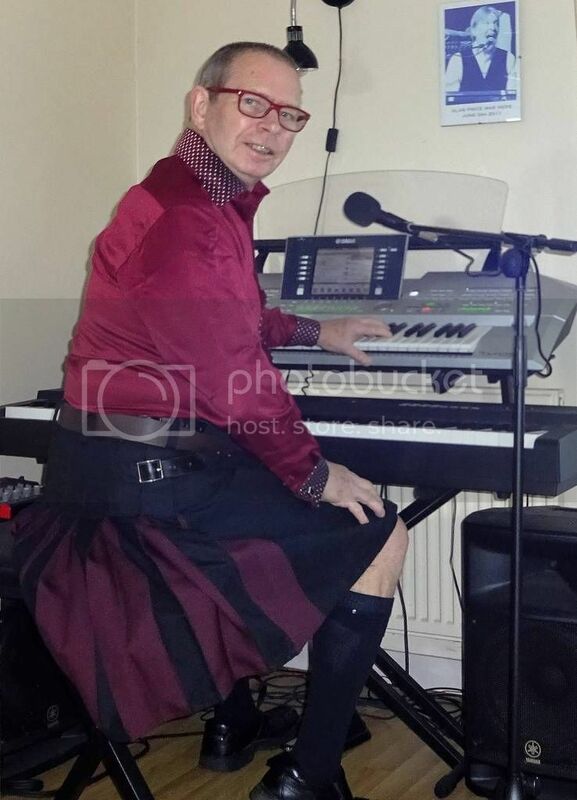 She's of course seen me in kilts anyway as I often wear one at the club. Being black leather instead of the usual woven variety didn't seem to be a problem. In fact it probably looked more practical as the rain was pelting down outside the store.